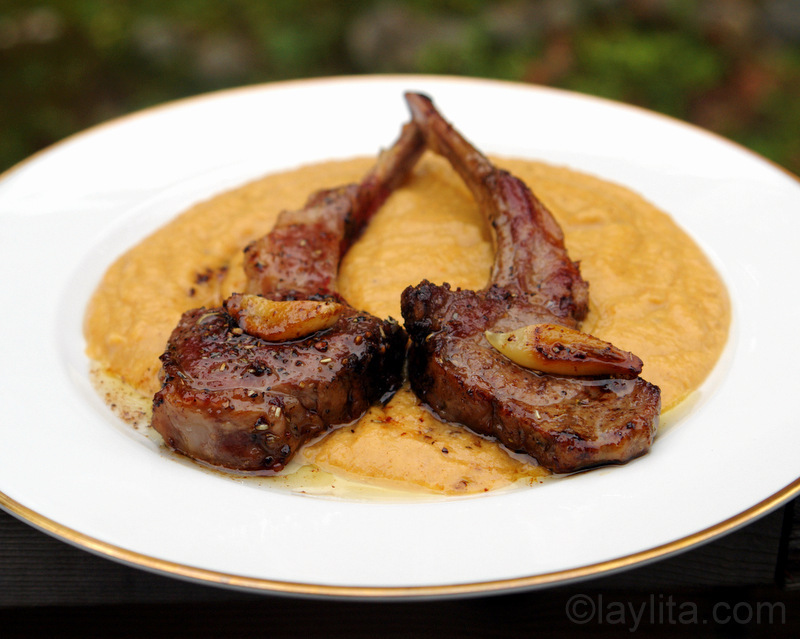 This is my husband’s delicious recipe for pan seared lamb chops. 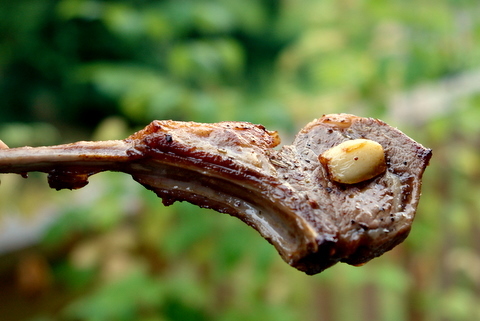 He prepares the lamb chops by seasoning them with olive oil and herbs, then pan sears with whole garlic cloves. I have a theory about how the guys cook, let me clarify that this theory excludes chefs, passionate foodies and sometimes my father in law; but does specifically include my husband and probably my dad. Nicolas –the husband – loves food and he also likes to cook, but he likes to keep it as simple, fast and as easy as possible. He also tends to use the first ingredients he sees in the fridge. I think that when he cooks he has two things in mind: first, he’s looking for something that will taste decent; and second, he wants his hunger to be satisfied as quickly as possible (without resorting to fast food). 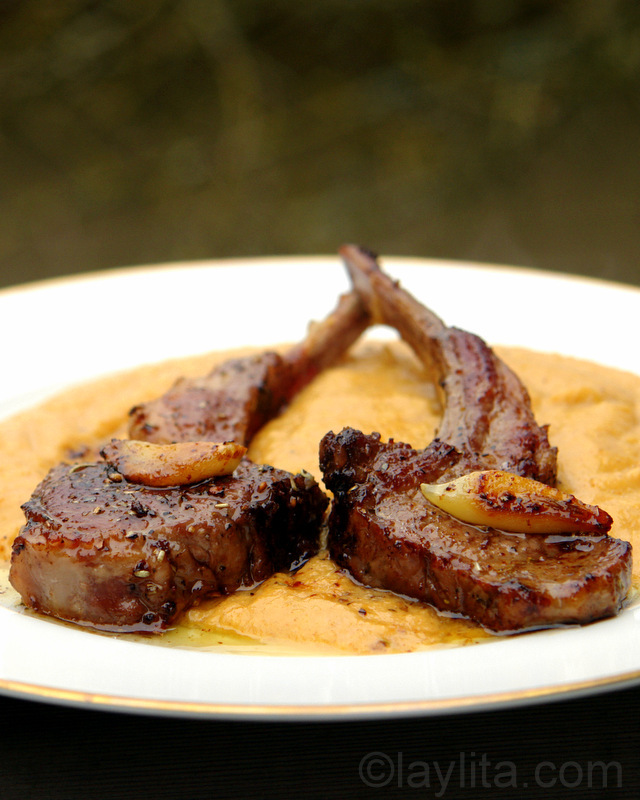 Recipe for pan seared lamb chops. 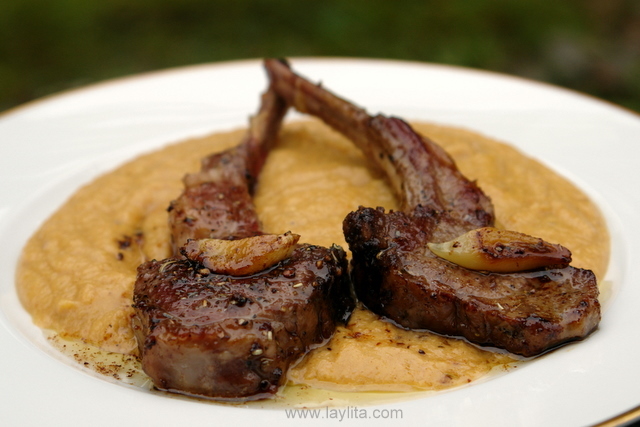 Quick and easy lamb chops seasoned with olive oil and herbs, then pan seared with garlic. 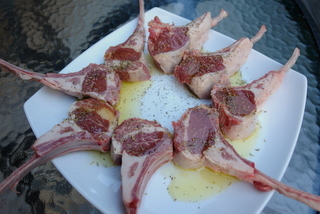 Season the lamb chops with the olive oil, the dried herb mix, salt and pepper. Melt the butter in a sauté pan over medium high heat. 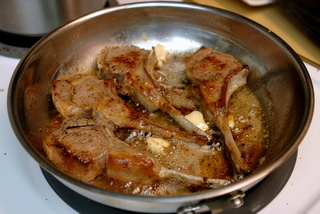 Add the lamb chops and garlic cloves; cook until the chops are golden on each side. I remember when I was a kid and on those rare days when my dad would cook he would always make the same dish: yuca or cassava in a peanut sauce. It was actually very good and for him it was easy to make. Of course, if my mom was gone for more than a few days we (kids) got really tired of eating the same thing for lunch and dinner every day. It made me very happy to see my mom when she returned (and thankfully it wasn’t very frequent that my dad had to cook). Nicolas also has this repetition thing going on -which going off track here is very different from the way he listens to music, he hates listening to the same song over and over (which is the opposite in my case I love listening the same song again and again until I am sick of it). Back to the cooking situation, in the summer he will add blueberries to every salad he makes – which tastes good, but maybe let’s alternate with raspberries or strawberries once in a while. The same thing happens with any type of meat he cooks: it will always have some herbes de Provence. Herbes de Provence is a mix of dried herbs that usually includes dried thyme, rosemary, marjoram, oregano, basil, sage, lavender, fennel, among others -you can find them in the dried herb and spice section at the supermarket, or mix your own. There will also be garlic involved and either olive oil or butter (or both). 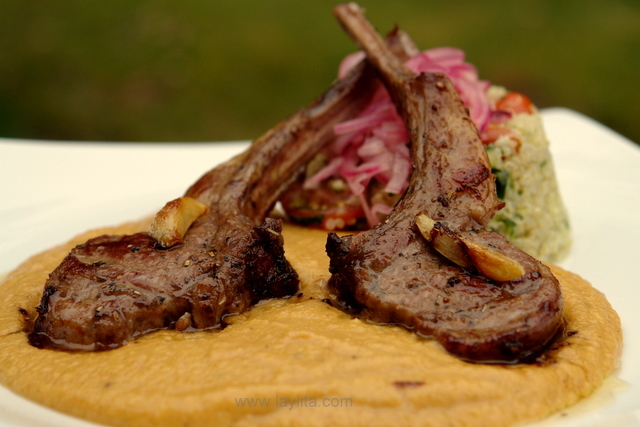 So, you can predict the ingredients of this lamb chop recipe, and in true Nico style it is very simple to make, as well as very quick and delicious. 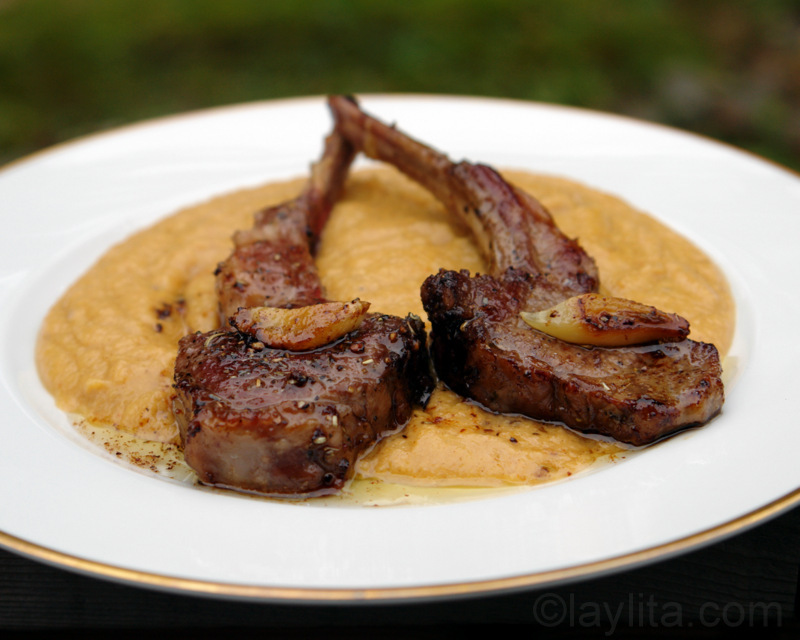 My most recent favorite side dish for lamb chops (or lamb roast) is a puree made with ripe plantains; the sweetness of the pure is a perfect match for the flavor of the lamb. 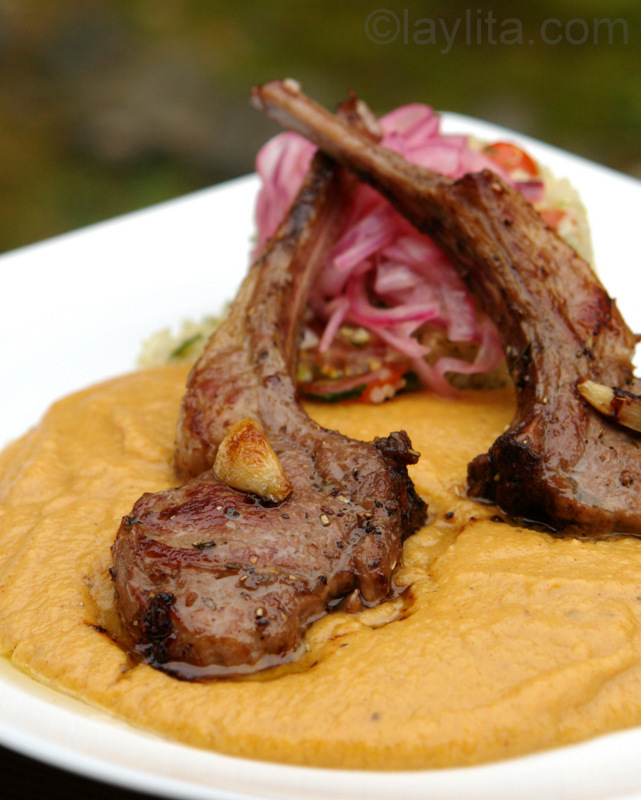 I also served these pan seared lamb chops with a refreshing quinoa salad with pickled red onions. Thank you for the stories and suggestions. I am waiting for the plantain recipe please & thank you. Seems easy to make. This sounds delish will try tonight. 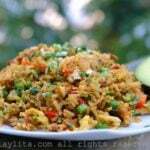 Most Practical easy and delicious. Why would you need butter when you’ve coated the chops with olive oil? 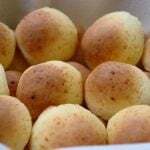 Axl – My husband is French, he cooks everything in butter (even if already coated with olive oil). I think, oil keeps the rub from falling off, butter keeps it from sticking to pan, and adds flavor. The plantain puree sound great, but i only need it for two people how would i accomidate the measurements? Hi Nicole – For the puree for just 2 people you should have enough with just use 1 plantain (instead of 6) so you can divide by the quantities by 6 (approximately, so for the garlic just use 1 small clove, etc). This looks delicious! How will I know when the lamb is done? Is it served well done? Rare? 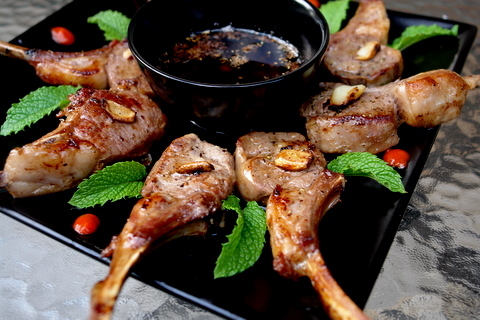 It depends on your preference, some will say that lamb should never be well done as it loses its tenderness, while other won’t eat any type of meat unless it is well done. Personally, I prefer it medium rare. Also, these chops are very thin so they just take a few minutes per side. I love that this seems relatively easy to make. I can’t wait to try it. Looks absolutely gorgeous. Simple is often the best. The plantain puree sound like a nice balance. Where’s a glass of Gigondas when I need one? Thanks for the stories and recipe. Beautiful. Todd. Looks almost too good to eat…almost. 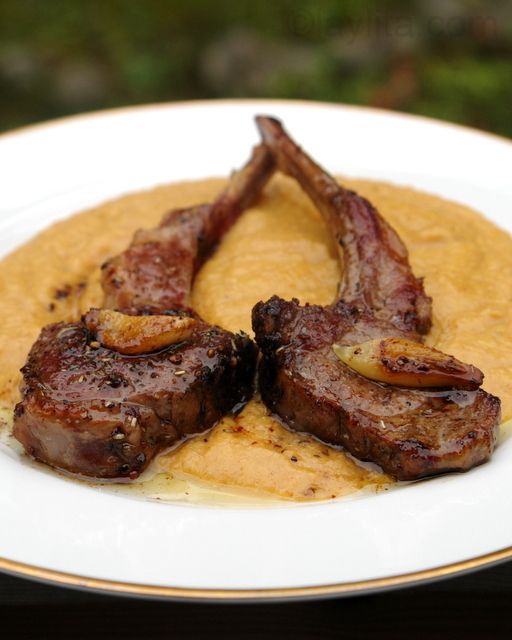 Love the idea of plantain puree and, as usual, your photos are terrific! I am so glad that I found you. Now somebody so talented like you, can show me how to cook some of my favorite recipes. Thank you Rosa. 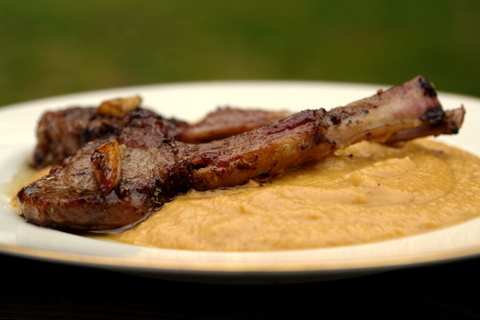 I’ll post the recipe for the plantain puree tomorrow.